The one-and-half-hour day cruise or sailing tour begins at the Lunenburg, Nova Scotia waterfront, a bustling section of the old town comprised of well-kept Georgian homes, The Fisheries Museum of the Atlantic, the government wharf, cozy restaurants, unique shops, pubs and accommodation establishments. It is this picturesque, well-preserved, part of Lunenburg that was designated a UNESCO World Heritage Site in 1995, one of only two communities in North America to have been given this distinction. Our sailboat, the Eastern Star, leaves the wharfs in Lunenburg five times daily. 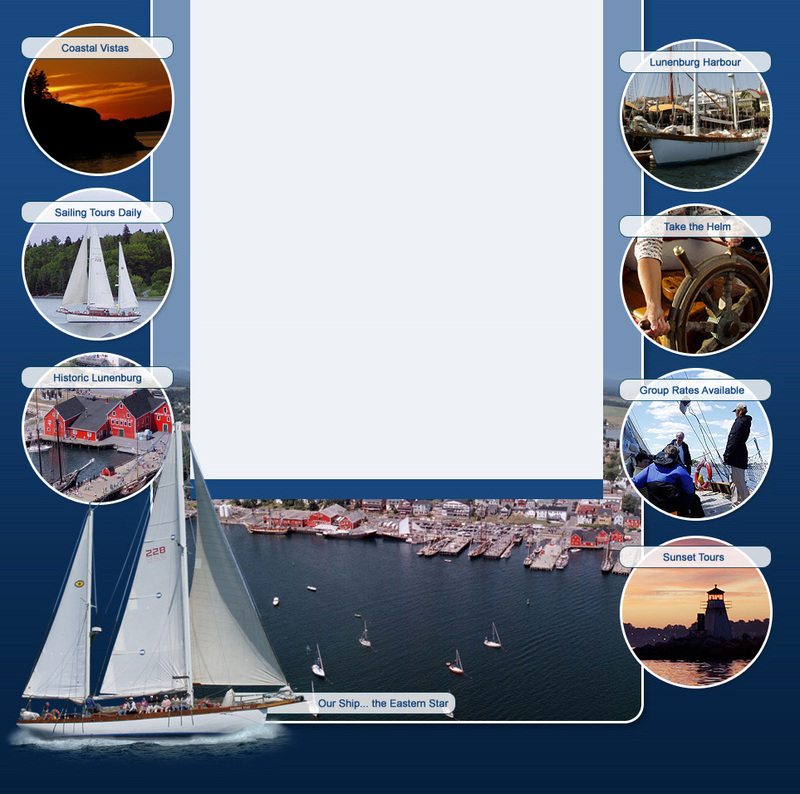 Our berth is not far from the famous schooner, 'Bluenose II', built in Lunenburg in 1962. The wind provides the power for our classic sailboat -- its motor off! With a little instruction from the crew, it's time for select passengers to raise a few sails, take the helm and feel the powerful allure of the wind and sea. Lunenburg Bay is beautiful, with the brightly painted buildings of the old town providing the perfect backdrop. There never seems to be enough time to take it all in. There are lighthouses to photograph and porpoises and seals on hand to entertain the passengers and crew. Nearing the shoreline, the Eastern Star sails by the old Smith and Ruland shipyard, birthplace of Canada's legendary racing schooner, Bluenose and Bluenose II, and the tall ships, the Bounty and the Rose. Further on, the crew tacks close to a group of large factory ships from the Lunenburg scallop fleet and passes the second largest fish processing plant in the world. On the daily, two hour Sunset Tour (6:30 p.m. July and August; call or e-mail for June, September, October schedules) passengers will discover the unusual sea caves of the Ovens Natural Park and explore the delightful fishing village of Blue Rocks. If Star Charters' Day and Sunset Tours are not quite what you're looking for, consider a private charter. The Eastern Star can be reserved for private functions, family, business, group and school outings for up to 30 people. For more information fill out the form on our reservations page or e-mail us at the address below. For Day and Sunset Tour rates and bookings, to record your comments regarding our website or cruises, or to ask specific questions of our captain and crew, click on our reservations page and fill out the form. You can expect a reply in 48 hours!